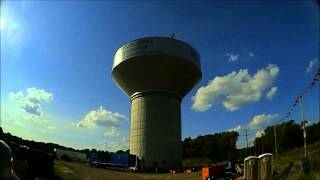 North Penn Water Authority Elevated Water Storage Tank Project Profile - Engineering | Entech Engineering, Inc. The North Penn Water Authority (NPWA) provides water to over 20 municipalities in Pennsylvania, reaching over 30,000 customers. NPWA utilizes water storage tanks to provide increased capacity during peak demands and to maintain water pressures throughout their water system. With growing consumer demands and existing water storage tanks aging and in need of repairs, requiring them to be temporarily taken out of service, the NPWA was at a crossroads. They needed to maintain quality water service while ensuring their infrastructure reliability. We assisted the NPWA with design, permitting, and construction administration and observation of a 3 million gallon elevated storage tank in Franconia Township to increase their system’s capacity and allow for older tanks to be renovated, while maintaining water service for their customers and insuring their system’s capacity, quality, and reliability for years to come. The 3 million gallon tank was designed as a composite tank with a concrete center column supporting the steel water storage tank above. At the time of its completion, the tank is the largest elevated composite tank on the east coast, with a total height of 145 feet. The center support shaft has a 60 foot diameter and the tank has a diameter of 120 feet. Design included flow metering, re-chlorination system, separate inlet/outlet pipes, tank mixing system, chemical storage/feed room, 16"/20" transmission main to the tank, and control system. Design included assistance with local municipalities, zoning approval, PADEP permitting, NPDES stormwater management permits, and FAA approval.